Move over Margin trading, Bitcoin Futures are here. In this blog we unravel margin trading and futures trading and break them down to simple concepts. It is meant to form a basic understanding of how leverage works and how it can be a huge asset for traders if used responsibly. The post is meant to serve as a primer for margin trading & futures trading and is written only for educational purposes. The terminology used is best suited cryptocurrency markets. Towards the end, we highlight differences between margin trading and futures trading and look at limitations of one over another. 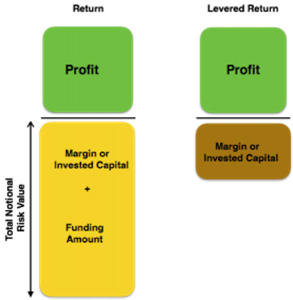 What is Margin Trading and why trade on margin? Trade with Caution – Losses can wipe out your capital! Margin trading allows traders to take positions which are larger in size than the amount of capital put-up by the trader. The remaining amount for the position is financed by the exchange you are trading with. Against these funds that the exchange provides it charges an interest to the trader. The exchange also holds the custody of purchased assets and uses them as collateral to recover its capital in case the trader suffers losses. The amount of funds provided by the exchange is called the funding-amount, the rate of interest charged for these funds is called the funding-rate and the amount of money contributed by the trader is called “margin”. Margin is often expressed in terms of the percentage of the total size (risk) of the trade. Hence a trader trading at 10% margin will only need funds equaling 10% of the position value, this position is said to have a 10x leverage. Similarly if a trader had kept 5% margin they would be trading at 20x leverage. Different platforms allow different margins to traders. On Delta Exchange traders can trade with as little as 1% margin or 100X leverage. The products listed on Delta Exchange are futures, which work in the similar way as margin trading does; as far as the P/L is concerned. Later in this blog, we will discuss how futures trading is different and the advantages of trading futures over margin trading. Let’s understand margin buying using an example, suppose you want to buy 100 units of ABC coin, which costs 0.01 BTC per coin. This would mean that your total position is worth, at the time of purchase ,1 Bitcoin. Let’s say that your exchange allows you to buy @ 10% margin and charges 0.01% daily interest on the funding provided. Hence in order to buy these coins you only have to put up 0.1 BTC of your own capital. The balance 0.9 BTC is being lent to you by the exchange. Against the borrowed funds, you shall pay the exchange 0.9*0.0001 = 0.00009 BTC everyday, in order to hold the position. Usually the borrow amount is netted against the P/L that the trader realises. Note that the 100 ABC coins purchased will also remain in exchange’s custody. If the value of ABC coin increases by 25% then 100 ABC coins will be worth 1.25 BTC. At this point, if you choose to sell the position, you will receive 1.25 BTC out of which the exchange will keep the 0.9 BTC it had lent you and your profit will be 0.25 BTC minus interest paid on the invested capital of 0.1 BTC. For this example we are going to assume the interest rate to be zero. Hence you’ve registered a 250% return on your invested capital of 0.1 BTC because of the 10X leverage. It is this boost in returns that makes margin trading attractive for traders. The profits are attractive but one has to be careful with margin trading as it is a two-edged sword. On the one hand, it will inflate your returns but on the other hand it can also wipe out your entire capital invested. Lets build on the previous example to see what happens if the ABC coin that you had purchased on margin reduces in value instead. The exchange does not want to take any price risk of ABC coin, hence when the value of your 100 ABC coins reaches 0.9 BTC i.e. ABC’s price drops by 10%, the exchange will sell these coins and recover its 0.9 BTC that it had lent you. This is called liquidation. In this example the liquidation price is 0.9 BTC. Remember that we are using interest rates as zero for simplicity in calculation. This is unlike buying the coin with 100% of your own capital. In that case if the coin value recovers you can still make profit or recover your losses. The primary idea behind margin trading is to trade using borrowed funds. This is powerful as it removes a big hurdle for traders but the flip side is that the lender keeps the custody of the purchased assets as collateral and will close the position when your losses equal your share in the position. The lender does not share your profits or losses but is paid a fixed interest on the funds they lend you. When a trader is buying with margin they are borrowing capital to buy a coin; similarly one can also borrow the coin itself. This is useful if a trader thinks that certain coin is overpriced and they want to sell it to profit from the downward movement in the price of that coin. Consider a coin XYZ that you think is going to reduce in value and hence you expect its price to drift lower. If you want to profit from this scenario, you should be selling the coin; but in order to sell the coin, you need to own/have the coin. A trader can overcome the above challenge by borrowing XYZ coin and selling them. This is called shorting. Lets say, for example, a trader borrows 100 XYZ coins and sells them @ market price of 0.01 BTC per coin. This sale would result in proceeds of 1 BTC. Suppose the price of XYZ coin falls by 15% to 0.0085 BTC. The trader can buy the coin back from the market @ cash totalling to 0.0085 BTC x 100 = 0.85 BTC and return the purchased coins to the lender. Hence realising a profit of 0.15 BTC minus the interest paid for borrowing the coin. Note that if the price of XYZ increases instead, the trader is going to suffer a loss. This creates a risk of default on trader’s part hence the exchange would need the trader to keep some margin money (collateral). A margin of 10% here would mean keeping 10% of the value of the short position, calculated using the price at which the short position was initiated i.e. a margin of 0.1 BTC. Margin trading has two primary advantages. Firstly, it allows traders to profit from both up and down moves in prices by going long or short on a coin. Secondly, margin trading allows traders to take a bigger position with the same initial capital. 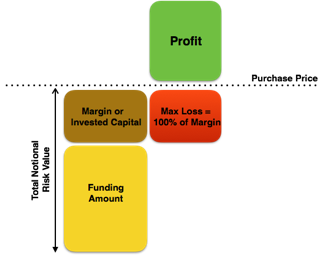 Margin trading has it pros but for traders it has lot of operational challenges. Firstly, traders need to find liquid borrow markets from where they can borrow funds/coins to trade long or short on margin. Secondly, the funding rates can be dynamic and can change on a daily basis which creates uncertainty in the pay-offs. Lastly, the supply of funds/coins limits the size of position that traders can take. This problem is solved by Futures Contracts. Futures contracts allow traders leverage just as margin-trading does and akin to margin trading traders can go both long or short. A trader who thinks that the price of Bitcoin is going to rise can buy a future from the list of available Bitcoin futures contracts on Delta Exchange. If a trader chooses to buy the 28th December BTC futures @ 3320 this would mean that they enter into a contract as-per which they are obliged to buy Bitcoin on 28th December @ 3320. The price of Bitcoin at the time of writing this post is 3336. Lets say that the price of Bitcoin rises to 3500 on 28th December. This would mean that the trader will register a profit on the long futures position which allows them to buy BTC @ 3320. By selling the purchased Bitcoins in market @ 3500 the trader will immediately register a profit of 180$ per Bitcoin. Similarly if the price of BTC fell to 3100 on 28th December the trader will register a loss of 220$ per Bitcoin. Just as in margin trading a trader is required to keep a margin to hold a position so too in futures margin is required to make sure that trader has enough funds to cover his looses at any time. Note that the trader does not need to hold the position till expiry. They can enter or exit the position in futures contract at any time prior to the expiry. As the price of Bitcoin moves up a trader’s long position will start to build unrealised profits and if it goes down it will start to suffer unrealised losses. 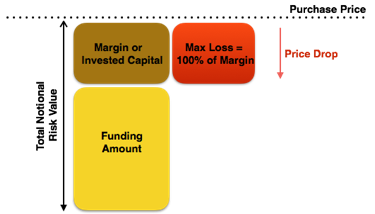 When the unrealised losses exceed the amount of margin kept by the trader, the position goes into liquidation and is closed by the exchange. This will happen for both long and short positions. If a trader enters a futures position on Delta Exchange the trader does not need to worry about borrowing and paying interest. Moreover, in margin trading, the amount that a trader can short is limited by how many coins are available to borrow. This is not a constraint in futures trading as the outstanding notional can be much higher than amount of circulating supply. Typically low leverage < 10x . Margin trading involves actually buying and selling in the spot market. This restricts the amount of notional a trader can trade. A 100K sale of Bitcoin in the spot market will move prices by 5~10%. This is a problem because there is less room for liquidation which in-turns puts a limit on leverage that is available. Typically high leverage 5x-500x.Because futures markets are deeper and can absorb higher volumes, leverage is higher. 100K USD sale in BTC futures can completed in seconds without moving market by more than 50bps. Not available on non-exchangeable underlyings such as index, volatility etc. Because of the borrow involved it is almost impossible to build long/short positions on an index. Margin trading is also not possible on derived quantities such as volatility etc. Futures can easily be made cash-settled and hence don’t have to depend on physical exchange of the underlying. Thus are easily available on indices, non-tradable assets. For example, Bitcoin futures traded on Delta Exchange are on Bitcoin index. You are soon going to see volatility futures and related products. Margin selling is restricted by supply. To sell 1mn USD worth BTC short you need to borrow BTC worth 1mn USD. Finding supply can often be a constraint. Moreover supply might be available for a short period of time but not for a longer tenure say 180 days or more. Not limited by supply. In futures there is no actual-borrow but just an assumption of interest rates. Hence neither supply is a problem nor tenure is an issue. Margin in trading asset only. Margin trading requires keeping margin in the same asset on which exposure is assumed. So for shorting Bitcoin you’d need Bitcoins as margin. In case of futures collateral need not be in the same asset on which exposure is assumed. For example a BTC-USD USDC quanto on Delta exchange test-net offers leveraged trading on Bitcoin where margin is kept in USDC. This product will be soon be available for trading on main-net. 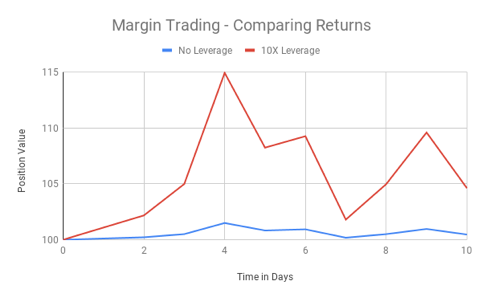 Margin trading is a powerful tool for traders, who are looking to improve their returns with leverage. It allows traders to take a big position without having the capital equaling the position size. Traders need to be careful with margin trading though, as one can lose their entire invested capital. Both these things apply to futures trading as well. Futures trading however is simpler as traders don’t need to borrow funds or assets to trade. The interest component is inbuilt in the price of the future and does not change for an existing position. Delta Exchange has futures listed on all major cryptocurrencies namely Bitcoin (BTC), Ethereum (ETH), Ripple (XRP) and Stellar Lumen (XLM). Traders can trade futures contracts on these cryptos using upto 100X leverage on Delta Exchange. Currently we only accept Bitcoin for margining. You can see the live prices of crypto futures here. Your email address is stored securely and updates are pertinent to cryptocurrency trading. We do not spam.